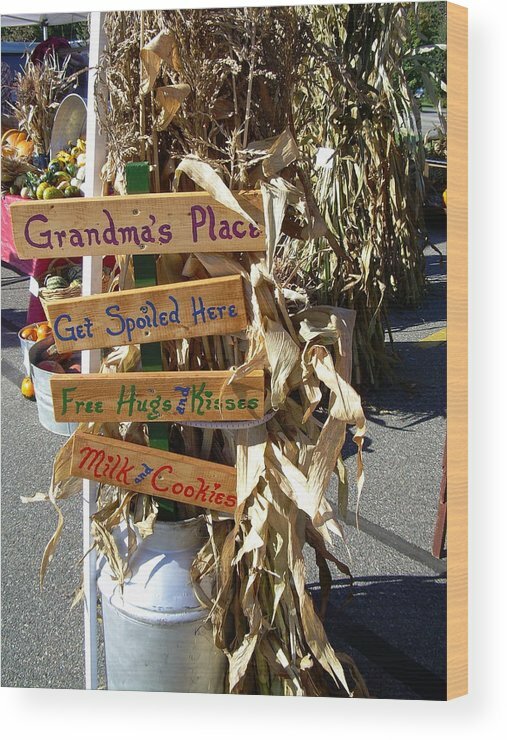 Grandma's Place Get Spoiled Here by Kent Lorentzen - 6.000" x 8.000"
Grandma's Place Get Spoiled Here wood print by Kent Lorentzen. Bring your artwork to life with the texture and added depth of a wood print. 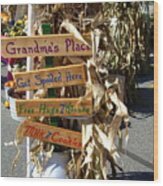 Your image gets printed directly onto a sheet of 3/4" thick maple wood. 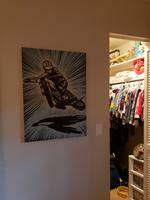 There are D-clips on the back of the print for mounting it to your wall using mounting hooks and nails (included). 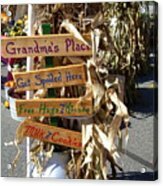 There are no comments for Grandma's Place Get Spoiled Here. Click here to post the first comment. 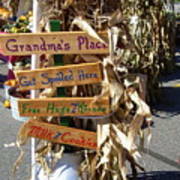 Grandma's Place, Get Spoiled Here, Free Hugs and Kisses, Milk and Cookies, sign and corn stalks on display at a farmers market on 22 September 2007.